You did it! You committed to giving yourself and your company the website of your dreams—the website you deserve. To get your site done right, you brought on a team of experts to help. One of those experts is an experienced website copywriter who you’ve pegged to create content that will bring your clients the best of you. And you know you need to bring your best self to the table to ensure your copywriter gets you right. But, if you’re not careful, you’ll find your actions derailing your project. Here’s the thing: all projects have a beginning and an end with critical steps in between. To keep everything on track and to get your content completed prior to your new website’s launch, it’ll take your support and investment. 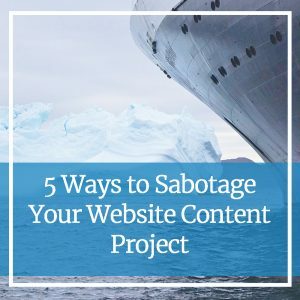 Be sure to avoid sabotaging your content project by failing to do what’s needed of you at all stages of the process. As your partner during this process, we want to make super sure that you’re pleased with the final product before it’s published for the world to see. That’s why we wanted to share with you some of the biggest mistakes business owners make when getting help with the content for their websites. If there’s one part in the process that is critical, it’s the content interview. We use this time to learn about your business, your clients and your offering, getting to know your unique voice. The info we gather is used to write your content from start to finish. We’ll be asking many questions about your services, your business background, your ideal client and more. If this information isn’t shared during the interview, it will not be incorporated into your content. Prepare! Take your time to properly prepare for your interview. Gather any materials ahead of the interview that might be helpful such as business contact information, services and more. Oftentimes a small business will invest in a website project and then assign the management of the project to an admin assistant or someone else. And while that may work from a general communications standpoint, that is not enough to ensure the right information gets conveyed to the writer. Without the right people in the room for the interview and along for the initial content review process, you’re setting yourself up for disappointment during the process and potential rewrites (which cost extra). Designate a single individual or small group who will be in charge of communication, content interview and feedback. Make sure those individuals involved are stakeholders—they have key information about the company, services and clients. Allow the same individuals to see the project through to the end, ensuring everyone’s on the same page from the get-go. This website project is uniquely your own. And although we can give insight and advice about your content, we don’t have a grasp on what you want until you communicate that to us. It’s incredibly difficult to make progress without a clear plan. Take some time before the project begins to sit down and brainstorm about what you want your website content to entail. What pages do you want? What would you like to see on each page? How many pages of content do you want to be written? What service do you want to feature? Create an initial roadmap for us to work from so we can ensure we deliver exactly what you’re looking for. During the website content creation process, we’ll send you content for your review. To keep the process moving and the project on time, you need to review your copy and get back to us within a set period. Sitting on your copy and failing to respond to our outreach can lead to delays, with long delays leading to potential added costs and frustration for everyone. Timely communication is especially important for larger projects, as we’ll likely send a few pages at first and then wait for feedback before diving deeper into the project. Why do we do it this way? We want to ensure tone and messaging are on point before crafting a large amount of copy for you. Agree to a set timeline with your website content and design team up front and commit to it. If you fall behind for any reason, communicate as soon as possible with your team. Your business is your baby. It’s your money-maker. You want to ensure that your website reflects what you’ve created and the goals you’ve set. But there’s a difference between asking good questions to ensure you get the results you desire and pushing back against all the recommendations from your team. Such pushback can cause animosity between you and your team, along with delays in the process and potentially added costs for those delays. If you disagree with your team’s advice, or if you change everything your team has brought to the table, it’s important that you sit back and question why you’re fighting against the experts you’ve brought in. And if you feel uncomfortable about something, let us know! We want your feedback. It’s also important to remember that you hired us to help with your project. Any suggestion we make is out of knowledge and expertise in our field. Trust us to carry out your project in the best way we know how. Are you feeling overwhelmed by your website content project? Give us a call! Let us address your concerns and put your mind at ease—we’ve got you. Reach out to us today by calling 612-643-1824 or send us a message online.